A new font module called gh_font has been added to GeeXLab since version 0.10.x. Let’s see how this module works. gh_font is a module that uses true type fonts to draw 2D / 3D text. 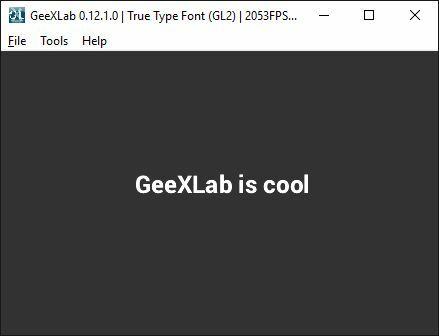 GeeXLab has others true type font functions in the gh_utils module (ftgl_font_xxx() functions). These true type font functions are based on the FreeTypeGL library. They work fine but are limited to OpenGL because FreeTypeGL is an OpenGL based lib. gh_font is not limited to OpenGL: we can use it with Vulkan and Direct3D 12 too. Another small difference between gh_font and gh_utils.ftgl_font_xxx() is that gh_font can only load *.ttf files while the FreeTypeGL functions can load *.ttf and *.otf files. TTF files are the most numerous so this small lack is not dramatic. gh_font is used by the new kx framework (more about it in another article) to display all information in OpenGL and Vulkan demos. 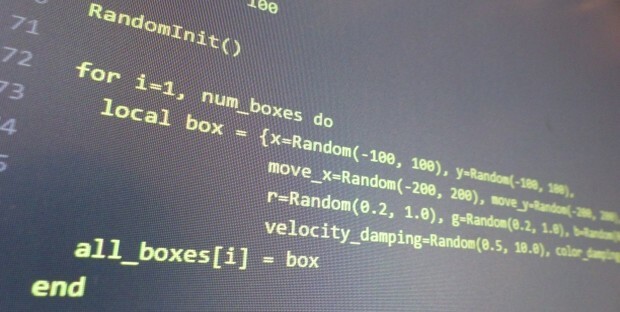 Here are the steps to create and use a font object with gh_font. local ttf_filename = demo_dir .. "./SoulMission.ttf"
The next steps are usually done in a FRAME script. 4/ Reset the font. This must be done every frame for dynamic texts or once for static texts. 5/ Write text. x and y are in screen coordinates (the point 0;0 is the top-left corner). GeeXLab demos related to this article are available in the code sample pack in the gl21/font-truetype/ folder.